Alan Moore really, really loves the fantasy novel The Vorrh by B. Catling, which he calls the new century’s first landmark work of fantasy. He’s so spellbound by Catling’s strange vision, he’s written a long, beautifully ranty intro. Read Moore’s intro exclusively at io9 — and listen to him reading it aloud! B. Catling is a man of many callings. As a poet, his remarkable The Stumbling Block remains a darkly glittering obelisk on the form’s late twentieth century landscape. As a performer, he presents a presence which is visceral and solid and yet borders on a kind of alchemy, while as the artist of obsessive cyclops miniatures he catalogues the haunting totem-figures of a personal dreamtime. In his writings, in his savage and compassionate novella Bobby Awl, there is an earthy shamanism to his resurrection of the dead from archive fragments and forgotten plaster death-masks. All these areas of accomplishment, however, are subordinated to the fact that Catling, first and foremost, is a sculptor. His affecting piece to mark the Tower of London’s former execution block, a tenderly indented cushion cast from glass so hot that it required a year of careful cooling, a degree a day, displays the mixture of robust and sometimes hazardous material process with a deep, heartfelt humanity which typifies his work. The quality of lithic stillness brought to his performances is sculptural, as too is the apparent working method which informs his poetry and prose: there is a sense of raw experiential elements crushed manually together into a new shape; of language worked between the fingers into different and surprising contours. This procedural approach is witnessed in The Stumbling Block’s successful crafting of a piece of mental furniture, or Bobby Awl’s stark evocation of the physical from a surviving cast of its historical protagonist’s tormented features. Nowhere, though, is Catling’s way with literary clay revealed more eloquently than within the genuinely monumental pages of The Vorrh. It’s represented in the trilogy’s enormous mass and in its artful combination of bark, metal, mud and stone to build an edifice inside the reader’s mind; a tactile craftsman’s attitude that’s signalled from an unforgettable opening scene which centres on the manufacture of a legendary bow. The scene in question, from this brief description, might be taken for a standard trope of fantasy and myth that could derive from Tolkien, Robin Hood or Rama, were it not for the material of the item’s manufacture. With this early revelation, the intrigued and startled reader is informed that, if indeed this is a work of fantasy, it is a fantasy quite unlike anything they may have previously encountered in that much-abused and putatively primal genre. Primal because in this field of things that never happen we can perhaps see the origins of the imagination as a human faculty, and much-abused because of the absurdly limited palette of concepts which have come to represent fantasy’s most identifiable features and markers. By definition, surely every fantasy should be unique and individual, the product of a single vision and a single mind, with all of that mind’s idiosyncrasies informing every atom of the narrative. A genre that has been reduced by lazy stylisation to a narrow lexicon of signifiers ... wizards, warriors, dwarves and dragons ... is a genre with no room for Bunyan’s Pilgrim’s Progress, arguably the earliest picaresque questing fantasy; for David Lindsay’s Voyage to Arcturus with its constantly morphing vistas and transmogrifying characters; for Mervyn Peake’s extraordinary Gormenghast books or for Michael Moorcock’s cut-silk Gloriana. It is certainly a genre insufficient to contain the vegetable eternities of Catling’s Vorrh. Please note that this is not to say that this feverish epic ruthlessly eschews genre conventions such as legendary bows, freakish monstrosities or, for that matter, haunted woodlands. Rather, in the fierce embrace of Catling’s language and in the context of the work’s hallucinatory and astounding milieu, such potentially shop-worn material transforms into a different substance altogether, as does the now corseted and hidebound genre struggling to encompass this unclassifiable extravagance. 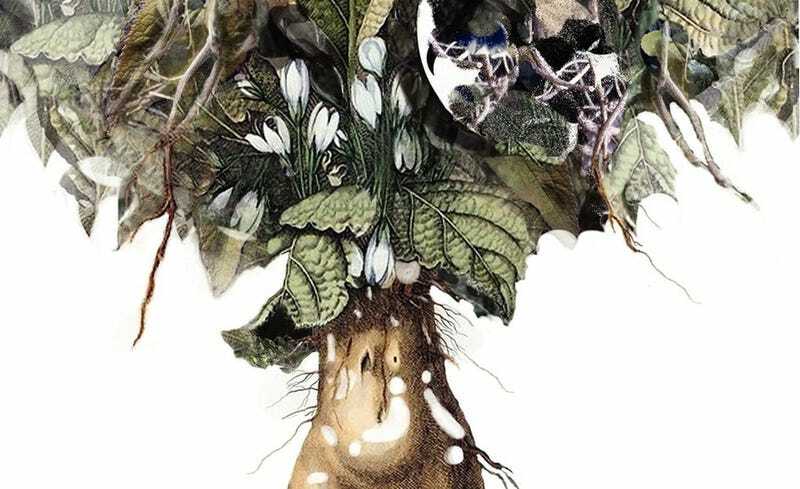 While in fantastic literature we’ve previously encountered the enchanted forest, it has not before included modern Irish peat-bogs and the jungles of colonial Africa amongst its various extremities. And where we may have chanced on angels in our fictions formerly, they are not simultaneously as awesome and as poignant as the disenfranchised Erstwhile. Although it is not in fact the case, The Vorrh could easily be taken for the work of someone who, prior to that point, had never read a line of fantasy, such is its staggering originality. As with the very best works in this slippery and elusive genre, one cannot pursue the intricacies and phantasmagorias of The Vorrh without a mounting certainty that the unfolding story is concerned with something other than its own remarkable contortions and reversals. Just as in the ritual labyrinth of Gormenghast that conjures twentieth century England so astutely, or in Lindsay’s Tormance which appears to speak to issues of both sexuality and metaphysics, so too in The Vorrh are fugitive suggestions of a world that’s obsolete and vanished, reconfigured radically and reassembled as the speculative inner-space cartography of territories to come, with personal psychology construed as undergrowth. Bakelite chimeras recall the 1950s working classes’ endless sepia indoors, just as the book’s crepuscular Victoriana conjures some lost Children’s Treasury of Empire, a resort of rained-off Sundays, vivid line engravings of unlikely animals, of dervishes, plate-lipped Ubangi, men with antiquated guns. In its Ernst-like collage of elements and sculptural assemblage of found objects, Catling’s striding debut builds a literature of unrestrained futurity out from the fond and sorry debris of a dissipating past. The Vorrh’s distinctive approach to character and cast of players is worth noting. Prising out obscure yet true-life stories from their real- world mountings to reset within his lurid and profound mosaic, Catling gives us Eadweard Muybridge, the anatomist of the moment, in an unbelievable but actual consultation with Sir William Withey Gull, alleged anatomist of Whitechapel, the historicity of these protagonists not for an instant out of place amidst the pageant of monocular and brooding outcasts or distressing headless anthropophagi. Within the moss-blurred reaches of The Vorrh’s untended paradise, the factual is not privileged in its relationship with the fantastical and each intrudes upon the other’s territory, an insidious kudzu creep that rewrites memory and leaves the fixed past open to invasion. There is the impression, as with any genuine mythology or romance, that these inconceivable events must in a sense have happened or perhaps be somehow happening perpetually, somewhere beneath the skin of being. Easily the current century’s first landmark work of fantasy and ranking amongst the best pieces ever written in that genre, with The Vorrh we are presented with a sprawling immaterial organism which leaves the reader filthy with its seeds and spores, encouraging new growth and threatening a great reforesting of the imagination. Comedies of manners set in mews and crescents that have lost their meaning, auto-heroising romps through sloppy pseudo-medieval fens, our writings are increasingly outgunned by our experience and are too narrow to describe, contain, or even name our current circumstance. In the original-growth arbours of The Vorrh, new routes are posited and new agendas are implicit in the sinister viridian dapple. As the greyed-out urban street-grid of our ideologies and ways of thinking falls inevitably into disrepair and disappearance, Catling’s stupefying work provides both viable alternatives and meaningful escape into its tropic possibilities. It offers us a welcome to the wilderness.